Is it time to replace my cartridge filters? Water Features, Water Falls and Fountains: What’s the best choice for your pool? Keeping up with maintenance on your swimming pool involves several things, including chemical balancing, equipment checks and cleaning of your pool. By far the most common way to remove dirt and debris from a swimming pool is to vacuum the steps, benches and floor of the pool. Here are a few reminders to consider the next time you vacuum your pool. 1. Turn off the heater: Most pool heaters require a high volume of water to be running through them in order to operate properly. Using a manual vacuum can restrict water flow and cause damage to your heater. Make sure the filter pump is primed and in high speed before turning the heater back on. 2. Fill vacuum hose with water: After assembling the vac head and hose to the pole, submerge the entire hose in the pool to fill it completely with water. 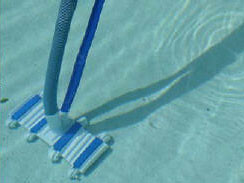 Another easy way to do this is to hold the other end of the vac hose up to a return jet in the pool. Once the vacuum head stops bubbling air it will rest on the bottom of the pool. Now you can insert the hose into the skimmer line without sucking air through the pump. 3. Adjust equipment valves for better suction: On a typical equipment setup there is a valve on the filter pump that controls the amount of suction on both the skimmer line and floor/wall drains of the pool. Once you have hooked up the manual vacuum to your skimmer line you can adjust the amount of suction on the vacuum by adjusting the valve at the equipment. Make sure you don’t turn off the wall/floor drain completely. The vacuum will restrict water flow through the equipment and the pump will eventually cavitate if this happens. Only close off the wall/floor drain valve until your hear the pump start to hesitate, then back off just a little bit. 4. Work the vacuum aross the width of the pool: This may just be a personal preference, but I find that starting in the shallow end of the pool and vacuuming a section of the width of the pool rather than going the length is much easier. This way you can make sure you don’t miss any spots in the middle. 5. Remove the vac hose from the skimmer first: This is an important step that prevents sucking air through the skimmer and filter pump. Make sure to always keep the vacuum submerged in the water and never pull it out before first disconnecting from the skimmer first. Great pool cleaning tips. These will also help your pool vacuum last much longer. Good article.